A Texas death-row inmate will get a shot at a new sentence after the Supreme Court ruled today that a state court applied the wrong standards to conclude that he was not intellectually disabled and therefore could be executed. Bobby James Moore was convicted and sentenced to death for shooting a supermarket employee during a 1980 robbery. But Moore argued that he was exempt from execution because he was intellectually disabled – for example, he failed first grade twice, still did not grasp basic principles like telling time at the age of 13, and had suffered a "debilitating" injury when he was hit in the head with a chain and a brick during the battle over integrating public schools. The Texas Court of Criminal Appeals – the state's court of last resort for criminal cases – rejected Moore's challenge to his death sentence. It relied on its 2004 decision in another case, Ex parte Briseno, involving an inmate's intellectual disability. Briseno used a set of 1992 standards for evaluating intellectual disability, along with several "evidentiary factors" that take into account, among other things, whether the people who knew the inmate best when he was growing up regarded him as intellectually disabled. Moore asked the Supreme Court to weigh in; today the justices, by a vote of 5-3, vacated the Texas court's ruling and sent the case back for a new look. 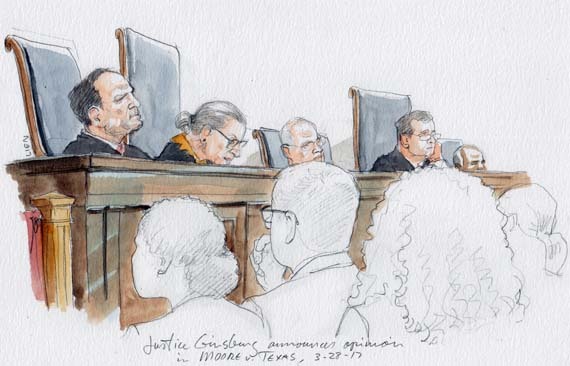 In an opinion by Justice Ruth Bader Ginsburg that was joined by Justices Anthony Kennedy, Stephen Breyer, Sonia Sotomayor and Elena Kagan, the court acknowledged that its recent decisions on intellectual disability and the death penalty assign to the states the primary responsibility for "the task of developing appropriate ways to enforce" the Constitution's bar on executing intellectually disabled inmates. But, the court explained, those decisions do not give the states free rein: Although states do not have to follow every detail of the most recent medical guide on intellectual disabilities, they cannot disregard the standards in those guides either. In this case, the court concluded, the Texas court's ruling was wrong in multiple respects. First, the justices reasoned, the Texas court should not have focused just on Moore's IQ score of 74. Instead, the Texas court should have also considered the standard error of measurement – that is, the amount that scores could fluctuate around a "true" score. Looked at that way, Moore's score would range from 69 to 79, which would have required the Texas court to consider other evidence of his possible intellectual disability. The Texas court's decision was also flawed, the Supreme Court continued, because it did not consider current clinical standards when evaluating how well Moore could handle the demands of everyday life, which is a key factor in determining whether someone is intellectually disabled. For example, the Texas court emphasized Moore's strengths – such as that he "lived on the streets, mowed lawns, and played pool for money" – when clinical standards indicate that it should have focused on his deficits. The Texas court made the problem even worse, the justices reasoned, when it looked to the "evidentiary factors" outlined in the Briseno case. Those factors were essentially invented by the Texas court, without any basis in either medicine or law; indeed, even Texas itself does not use them to determine whether someone is intellectually disabled in other contexts. Instead, the court stressed, the factors rely on inaccurate stereotypes of the intellectually disabled by laypeople and are intended to reflect a consensus by Texans as to which defendants should or should not be subject to the death penalty. But even if an inmate has a relatively mild disability, the court emphasized, such that the Briseno factors would suggest that he is not exempt from execution, the Constitution bars the states from executing anyone with an intellectual disability. Chief Justice John Roberts dissented from today's ruling, in an opinion joined by Justices Samuel Alito and Clarence Thomas. 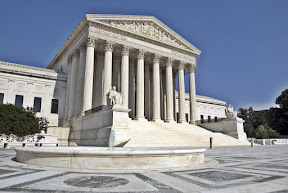 As an initial matter, Roberts agreed with the majority that the Texas court's reliance on the Briseno evidentiary factors was "incompatible with the Eighth Amendment." But, in Roberts' view, that conclusion was irrelevant, because he would have let stand the Texas court's conclusion that, based on his IQ, Moore was not intellectually disabled. More broadly, Roberts complained that the court's ruling today does not give states enough guidance about how to proceed in similar cases going forward: "States have 'some flexibility' but cannot 'disregard' medical standards. Neither the Court's articulation of this standard nor its application sheds any light on what it means." After the oral argument, today's decision was not entirely unexpected. But it still represents a big victory for Bobby James Moore and other intellectually disabled inmates on death row in Texas. And it will likely lead to new litigation in the other states that have not adopted legal definitions of intellectual disability that are not specifically based on the current medical standards. Whether it will lead to the confusion at which Roberts hints remains to be seen. The post Opinion analysis: A victory for intellectually disabled inmates in Texas appeared first on SCOTUSblog. Copeland, Christopher T.; Mahoney, James J.; Block, Cady K.; Linck, John F.; Pastorek, Nicholas J.; Miller, Brian I.; Romesser, Jennifer M.; Sim, Anita H.
Rabin, Laura A.; Paolillo, Emily; Barr, William B.
Multi-group and hierarchical confirmatory factor analysis of the Wechsler Intelligence Scale for Children—Fifth Edition: What does it measure? Reynolds, Matthew R.; Keith, Timothy Z. Trial 1 Versus Trial 2 of the Test of Memory Malingering: Evaluating Accuracy Without a "Gold Standard". Mossman, Douglas; Wygant, Dustin B.; Gervais, Roger O.; Hart, Kathleen J.